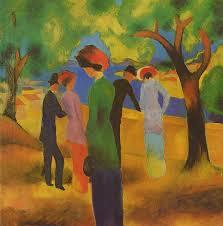 Expressionism was an art movement of the early 20th century that began in Germany. Typically, expressionist art presents an image from a subjective perspective, then distorting the image in order to evoke a certain mood or idea. Expressionist art attempts to evoke meaning, rather than physical reality. Edvard Munch’s classic work The Scream is considered to be the first expressionist painting. The term “expressionism” was first used in a 1901 Paris exhibition by the artist Julien-Auguste Herve, as term opposite of impressionism. In 1905, four German artists formed The Bridge in Dresden, the first Expressionist organization. Several years later, another group of German artists, including Wassily Kandinsky, Franz Marc, Paul Klee, and August Macke, formed Der Blaue Reiter (The Blue Rider), using expressionism in painting, poetry, and theater. Expressionism is often difficult to define, as it often includes aspects of other early 20th century art, including Cubism, Dadaism, and Surrealism. However, these German artists were all reacting to the dehumanizing effects of industrialism and the expansion of urbanism in Germany, and universally rejected idealism. American artist Marsden Hartley, who met Kandinsky, brought expressionism to New York, and after many European artists moved there during World War II, expressionism defined much American art in the 1950s. Kirchner Street, Dresden - This paper attempts to discuss Ernst Ludwig Kirchner’s painting Street, Dresden. Abstract Expressionist Artists research papers discuss one of the first major art movements to create global impact in the art world. Paper Masters writes custom research papers on Expressionism Art and look into the art movement that started in Germany that presented images in a distorted and subjective perspective.